Breaching the boundaries of the permissible? Abstract: Across the secular West, the slaughter of animals for food has become an almost clandestine activity. Very occasionally however, when slaughter comes into view, social and political controversy emerges. In this paper, I examine two such episodes in England and the controversies subsequently engendered: the controversy over kosher meat and the Jewish method of slaughter (shechita) in the 19th century, and the contemporary controversy over halal meat and the Muslim method of slaughter (dhabiha). These controversies are complex and double-edged in that, not only do they involve food, which often invokes anxieties about what is being ingested and what moral boundaries are being crossed, they also involve religion. Both episodes are also linked to periods of rapid migration into the UK, and to concerns about integration and the threats posed to British values and national identity by the food practices of outsiders. However, while concern over kosher meat production and Jewish migrants in the 19th century was largely concealed within the spatial boundaries of Jewish communities, from the late 20th century onwards halal meat has become increasingly visible in line with the demographic expansion of the Muslim population out of racialized community spaces. It is in this context, I contend, in line with a new and emerging geography of religious food practice, that halal meat has breached the boundaries of the permissible to challenge the ‘civilized’ values underpinning the hegemonic food discourse. Supermarket food waste: prevent, redistribute, share - Towards a circular economy? John Lever, Fiona Cheetham, & Morven McEachern, University of Huddersfield Business School. This project report explores the sharing of supermarket food waste in Kirklees, West Yorkshire. Conducted over a nine-month period from September 2017, the research was funded by the University of Huddersfield Business School. In the project, we used qualitative methods to explore whether the sharing of supermarket food waste through NGOs increases the sustainability of the wider food system, or if this trend is a response to its increasing unsustainably. Looking beyond the current extractive industrial model that generates so much waste, in principle the circular economy aims to redesign products and services to eliminate waste at source. It is the links between sharing and circular thinking and the wider relationship with the sustainability of the food system that this project report is ultimately concerned with. There was a general consensus that it is all but impossible to eliminate food waste completely from supermarket operations and international food supply chains. Even in a sustainable food system, there will always be a degree of surplus food to be redistributed to people in need. All the NGOs consulted were reluctant to call the food they received from supermarkets “waste”, and the terms “wasted food” and “spare food” were sometimes used interchangeably with the notion of “surplus food”. In this context, corporate social responsibility (CSR) is often used to justify the linear model of food production and consumption that generates vast quantities of food waste. Independent food banks (IFBs) encounter a number of problems and barriers in their work. These revolve around the type and volume of food they receive from supermarkets, which they have no control over. Conversely, NGOs within the national distribution network (NDN) never accept supermarket “surplus” unless it is in good condition and they have the capacity to redistribute/share it before it becomes “food waste”. The value of the work being done by NGOs was widely recognized, yet concerns were expressed from both a political and environmental perspective about the normalization of these ways of working. Sending less ‘surplus’ food to anaerobic digestion as ‘waste’ in order to share and redistribute more food through NGOs was seen by some interviewees as one way of enhancing the links between sharing and circular economic thinking. At the same time, others argued that these ways of working add another level of governance to the existing linear model. Central government policy is not keeping up with the developments in technology that can drive movement towards a circular economy. As well as redistributing and sharing surplus food from supermarkets regionally, more food needs to be produced regionally, both on local farms and through the use of vertical farming, for example, to minimize food waste at source and encourage circular economic thinking. While it is difficult to envisage a completely circular food system emerging, cities and regions such as Kirklees can help to reduce the burden of supermarket food waste by encouraging circular economic thinking. But better Central Government Policy and sustainable business models are needed to facilitate movement in this direction. Public and private bodies at the regional and national level must navigate the tensions involved as a matter of urgency. In the first decades of the 21st century, kosher and halal markets have become global in scope and states, manufacturers, restaurants, shops and consumers around the world have been presented with ever stricter and more complex kosher and halal requirements. 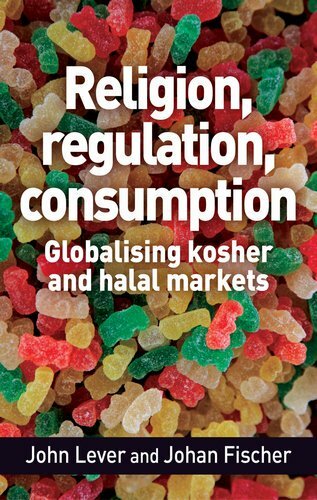 Religion, regulation, consumption: Globalising kosher and halal markets explores the emergence and expansion of these markets for religiously certified food products with a particular focus on the UK and Denmark. This is the first book of its kind to explore kosher and halal comparatively in this context and there is a particular focus on the market, consumers, religious organisations and the state. The book moves beyond traditional concerns for kosher and halal meat production and consumption to include developments in biotechnology. It also explores the challenges faced by kosher and halal consumers in this context, and the need for more elaborate forms of justification and self-discipline in deciding what is and is not acceptable. The industrial food system faces many challenges. In recent decades the increasing production and consumption of high calorie, cheap processed food has undermined food security and contributed to a rapid increase in obesity and diet related ill health worldwide (Carolan 2013). The overuse of antibiotics in industrial animal agriculture provides a good example of the issues involved. Many global food companies use antibiotics to prevent rather than treat disease on factory farms and this is now recognized as a major contributory factor in the increase of antibiotic resistance worldwide (Akhtar, 2012). This is hugely significant for animal, environmental and human health and a number of studies have shown that antibiotics in the human food chain contribute to diet related ill health (Collins 2012; Lam et al 2012). A backlash against antibiotic use is now emerging and there is an embryonic movement for factory farm divestment (Levitt 2016). To some extent, the global expansion of halal can be linked with concerns and anxieties about industrial food production. The halal food industry is estimated to be worth around $700 billion annually and with the Muslim population expected to increase from 1.6 billion to 2.2 billion by 2030 the opportunities on the horizon are vast (Bergeaud-Blackler et al 2016). In Arabic, the word ‘halal’ literally means ‘permissible’ or ‘lawful’ and in relation to food in particular it signifies ‘purity’ and is protected by certain Islamic practices. A number of Muslim requirements have been met in the global food industry, including injunctions to avoid substances where there is a threat of cross contamination from unacceptable ingredients, yet it has also been argued that the halal certification industry must make it easier for halal consumers to chose healthier food options (Tieman 2016). Much as the UK food industry is under pressure to shorten supply chains and improve sustainability in the aftermath of the horsemeat scandal of 2013, so there is a focus in Malaysia – a leading player in the global halal industry – to incorporate thoyyib into all stages of halal production and assurance. Halal assurance first emerged in Malaysia in the 1980s and Malaysia has since been recognised as a major halal hub in Southeast Asia through cooperation with states such as Indonesia, Brunei and Australia. Instrumental in the development of internationally recognised halal standards, Malaysia has been particularly successful in bridging Islamic traditions with the demands of international markets though its state led certification scheme overseen by JAKIM (Department of Islamic Development of Malaysia) and Nestlé Malaysia. This has added a new dimension to the global production and consumption of halal and Malaysia is pursuing plans to become a global halal hub by improving all aspects the global supply chain. A better understanding of the notion of thoyyib is now seen to be central to this process. Little understood, thoyyib is an integrative concept that relates to food safety and quality-produced food and a number of links can be made with sustainable food production and consumption. There has been growing Muslim interest in organic halal food in Europe for a number years and London recently hosted the UK’s first Halal Food Festival, which attracted many consumers from beyond the Muslim community. The links between organic food and thoyyib are evident in the shared focus on a hygienic, nutritious and healthy way of life, and it has recently been argued that the certification of nutritionally deficient halal products is therefore misleading (Tieman 2016). Halal and sustainability are now both seen as opportunities. It is no longer enough for producers to focus solely on what type of food is produced – how food is produced is just as important. As well as product ingredients, consumers everywhere are increasingly concerned about farm animal welfare, transport, packaging and waste management, and many are demanding nutritious and quality food options that allow them to lead a healthier lifestyle. Thoyyib provides an opportunity, if better understood, to improve the many aspects of halal production, thus contributing towards a more sustainable and secure food future. Halal is no longer simply an expression of contested forms of production and consumption. It is part of a rapidly expanding, globalized market that is starting to bring the concerns of Muslim and non-Muslim consumers closer together. Bergeaud-Blackler F., Fischer, J. and Lever, J. (2015) Halal Matters: Islam, politics and markets in global perspective London, UK: Routledge. Carolan, M. (2013) Reclaiming Food Security, Earthscan: Routldege. Lam, David W., and LeRoith, D. (2012) “The worldwide diabetes epidemic”, Current Opinion in Endocrinology, Diabetes and Obesity 19.2. “Halal alone won’t take you far. Food must also be “thoyyiban”. Statement by the President of the Nestlé Halal Committee Regulatory Affairs of Malaysia, published in a Department of Standards Malaysia newsletter http://fr.scribd.com/doc/25463489/SH-Nestle-Malaysia(consulted on January 24, 2014).